This article is about the Reuters news agency. For the current parent company, see Thomson Reuters. For the former parent company prior to its 2008 acquisition by The Thomson Corporation, see Reuters Group. Reuters (/ˈrɔɪtərz/) is an international news organization. It is a division of Thomson Reuters and has nearly 200 locations around the world. Until 2008, the Reuters news agency formed part of an independent company, Reuters Group plc, which was also a provider of financial market data. Since the acquisition of Reuters Group by the Thomson Corporation in 2008, the Reuters news agency has been a part of Thomson Reuters, making up the media division. Reuters transmits news in English, French, German, Italian, Spanish, Portuguese, Russian, Urdu, Arabic, Japanese, Korean, and Chinese. It was established in 1851. The Reuter agency was established in 1851 by Paul Julius Reuter in Britain at the London Royal Exchange. Paul Reuter worked at a book-publishing firm in Berlin and was involved in distributing radical pamphlets at the beginning of the Revolutions in 1848. These publications brought much attention to Reuter, who in 1850 developed a prototype news service in Aachen using homing pigeons and electric telegraphy from 1851 on in order to transmit messages between Brussels and Aachen, in what today is Aachen's Reuters House. 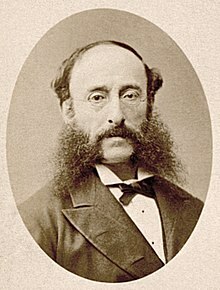 Upon moving to England, he founded Reuter's Telegram Company in 1851. Headquartered in London, the company initially covered commercial news, serving banks, brokerage houses, and business firms. The first newspaper client to subscribe was the London Morning Advertiser in 1858. Afterwards more newspapers signed up, with Britannica Encyclopedia writing that "the value of Reuters to newspapers lay not only in the financial news it provided but in its ability to be the first to report on stories of international importance." Reuter's agency built a reputation in Europe and the rest of the world as the first to report news scoops from abroad. Reuters was the first to report Abraham Lincoln's assassination in Europe, for instance, in 1865. In 1872, Reuters expanded into the far east, followed by South America in 1874. Both expansions were made possible by advances in overland telegraphs and undersea cables. In 1883, Reuters began transmitting messages electrically to London newspapers. In 1923, Reuters began using radio to transmit news internationally, a pioneering act. In 1925, The Press Association (PA) of Great Britain acquired a majority interest in Reuters, and full ownership some years later. During the world wars, The Guardian reported that Reuters "came under pressure from the British government to serve national interests. In 1941 Reuters deflected the pressure by restructuring itself as a private company." The new owners formed the Reuters Trust. In 1941, the PA sold half of Reuters to the Newspaper Proprietors' Association, and co-ownership was expanded in 1947 to associations that represented daily newspapers in New Zealand and Australia. The Reuters Trust Principles were put in place to maintain the company's independence. At that point, Reuters had become "one of the world's major news agencies, supplying both text and images to newspapers, other news agencies, and radio and television broadcasters." Also at that point, it directly or through national news agencies provided service "to most countries, reaching virtually all the world's leading newspapers and many thousands of smaller ones," according to Britannica. In 1961, Reuters scooped news of the erection of the Berlin Wall. Reuters was one of the first news agencies to transmit financial data over oceans via computers in the 1960s. In 1973, Reuters "began making computer-terminal displays of foreign-exchange rates available to clients." In 1981, Reuters began making electronic transactions on its computer network and afterwards developed a number of electronic brokerage and trading services. Reuters was floated as a public company in 1984, when Reuters Trust was listed on the stock exchanges such as the London Stock Exchange (LSE) and NASDAQ. Reuters later published the first story of the Berlin Wall being breached in 1989. The share price grew during the dotcom boom, then fell after the banking troubles in 2001. In 2002, Brittanica wrote that most news throughout the world came from three major agencies: the Associated Press, Reuters, and Agence France-Presse. 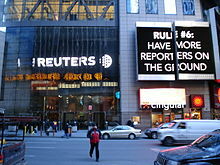 Reuters merged with Thomson Corporation in Canada in 2008, forming Thomson Reuters. In 2009, Thomson Reuters withdrew from the LSE and the NASDAQ, instead listing its shares on the Toronto Stock Exchange and the New York Stock Exchange. The last surviving member of the Reuters family founders, Marguerite, Baroness de Reuter, died at age 96 on 25 January 2009. The parent company Thomson Reuters is headquartered in Toronto, and provides financial information to clients while also maintaining its traditional news-agency business. In 2012, Thomson Reuters appointed Jim Smith as CEO. Almost every major news outlet in the world subscribed to Reuters as of 2014. Reuters operated in more than 200 cities in 94 countries in about 20 languages as of 2014. In July 2016, Thomson Reuters agreed to sell its intellectual property and science operation for $3.55 billion to private equity firms. In October 2016, Thomson Reuters announced expansions and relocations to Toronto. As part of cuts and restructuring, in November 2016, Thomson Reuters Corp. eliminated 2,000 worldwide jobs out of its around 50,000 employees. Reuters employs some 2,500 journalists and 600 photojournalists in about 200 locations worldwide. Reuters journalists use the Reuters Handbook of Journalism as a guide for fair presentation and disclosure of relevant interests, to maintain the values of integrity and freedom upon which their reputation for reliability, accuracy, speed and exclusivity relies. In May 2000, Kurt Schork, an American reporter, was killed in an ambush while on assignment in Sierra Leone. In April and August 2003, news cameramen Taras Protsyuk and Mazen Dana were killed in separate incidents by U.S. troops in Iraq. In July 2007, Namir Noor-Eldeen and Saeed Chmagh were killed when they were struck by fire from a U.S. military Apache helicopter in Baghdad. During 2004, cameramen Adlan Khasanov in Chechnya and Dhia Najim in Iraq were also killed. In April 2008, cameraman Fadel Shana was killed in the Gaza Strip after being hit by an Israeli tank. While covering China's Cultural Revolution in Peking in the late 1960s for Reuters, journalist Anthony Grey was detained by the Chinese government in response to the jailing of several Chinese journalists by the colonial British government of Hong Kong. He was released after being imprisoned for 27 months from 1967 to 1969 and was awarded an OBE by the British Government. After his release, he went on to become a best-selling historical novelist. In May 2016, the Ukrainian website Myrotvorets published the names and personal data of 4,508 journalists, including Reuters reporters, and other media staff from all over the world, who were accredited by the self-proclaimed authorities in the separatist-controlled regions of eastern Ukraine. In 2018, two Reuters journalists were convicted in Myanmar of obtaining state secrets while investigating a massacre in a Rohingya village. The arrest and convictions were widely condemned as an attack on press freedom. The journalists, Wa Lone and Kyaw Soe Oo, received several awards, including the Foreign Press Association Media Award, and were named as part of the Time Person of the Year for 2018 along with other persecuted journalists. Reuters has a policy of taking a "value-neutral approach," which extends to not using the word "terrorist" in its stories, a practice which attracted criticism following the September 11 attacks. Reuters' editorial policy states: "We are committed to reporting the facts and in all situations avoid the use of emotive terms. The only exception is when we are quoting someone directly or in indirect speech." By contrast, the Associated Press does use the term "terrorist" in reference to non-governmental organizations who carry out attacks on civilian populations. Following the September 11 attacks, Reuters global head of news Stephen Jukes reiterated the policy in an internal memo and later explained to media columnist Howard Kurtz (who criticized the policy): "We all know that one man's terrorist is another man's freedom fighter, and that Reuters upholds the principle that we do not use the word terrorist... We're trying to treat everyone on a level playing field, however tragic it's been and however awful and cataclysmic for the American people and people around the world. We're there to tell the story. We're not there to evaluate the moral case." In early October 2001, CEO Tom Glocer and editor-in-chief Geert Linnebank and Jukes later released a statement acknowledging that Jukes' memo "had caused deep offence among members of our staff, our readers, and the public at large" and wrote: "Our policy is to avoid the use of emotional terms and not make value judgments concerning the facts we attempt to report accurately and fairly. We apologize for the insensitive manner in which we characterized this policy and extend our sympathy to all those who have been affected by these tragic events." In September 2004, The New York Times reported that Reuters global managing editor, David A. Schlesinger objected to Canadian newspapers' editing of Reuters articles to insert the word terrorist. Schlesinger said: "my goal is to protect our reporters and protect our editorial integrity." In July 2013, David Fogarty, former Reuters climate change correspondent in Asia, resigned after a career of almost 20 years with the company and wrote about a "climate of fear" which resulted in "progressively, getting any climate change-themed story published got harder" following comments from then deputy editor-in-chief Paul Ingrassia that he was a "climate change sceptic". In his comments, Fogarty stated that "Some desk editors happily subbed and pushed the button. Others agonised and asked a million questions. Debate on some story ideas generated endless bureaucracy by editors frightened to make a decision, reflecting a different type of climate within Reuters—the climate of fear," and that "by mid-October, I was informed that climate change just wasn't a big story for the present. …Very soon after that conversation I was told my climate change role was abolished." Ingrassia, formerly Reuters' managing editor, previously worked for The Wall Street Journal and Dow Jones for 31 years. Reuters responded to Fogarty's piece by stating that "Reuters has a number of staff dedicated to covering this story, including a team of specialist reporters at Point Carbon and a columnist. There has been no change in our editorial policy." Subsequently, climate blogger Joe Romm cited a Reuters article on climate as employing "false balance", and quoted Dr. Stefan Rahmstorf, Co-Chair of Earth System Analysis at the Potsdam Institute that "[s]imply, a lot of unrelated climate skeptics nonsense has been added to this Reuters piece. In the words of the late Steve Schneider, this is like adding some nonsense from the Flat Earth Society to a report about the latest generation of telecommunication satellites. It is absurd." Romm opined that "We can't know for certain who insisted on cramming this absurd and non-germane 'climate sceptics nonsense' into the piece, but we have a strong clue. If it had been part of the reporter's original reporting, you would have expected direct quotes from actual skeptics, because that is journalism 101. The fact that the blather was all inserted without attribution suggests it was added at the insistence of an editor." According to Ynetnews, Reuters was accused of bias against Israel in its coverage of the 2006 Israel–Lebanon conflict after the wire service used two doctored photos by a Lebanese freelance photographer, Adnan Hajj. In August 2006, Reuters announced it had severed all ties with Hajj and said his photographs would be removed from its database. In 2010, Reuters was criticised again by Haaretz for "anti-Israeli" bias when it cropped the edges of photos, removing commandos' knives held by activists and a naval commando's blood from photographs taken aboard the Mavi Marmara during the Gaza flotilla raid, a raid that left nine Turkish activists dead. It has been alleged that in two separate photographs, knives held by the activists were cropped out of the versions of the pictures published by Reuters. Reuters said it is standard operating procedure to crop photos at the margins, and replaced the cropped images with the original ones after it was brought to the agency's attention. In March 2015, the Brazilian affiliate of Reuters released a text containing an interview with Brazilian ex-president Fernando Henrique Cardoso about the ongoing Petrobras scandal. One of the paragraphs mentioned a comment by a former Petrobras manager, in which he suggests corruption in that company may date back to Cardoso's presidency. Attached to it, there was a comment between parenthesis: "Podemos tirar se achar melhor" ("we can take it out if [you] think it would be better"), which is now absent from the current version of the text. The agency later issued a text in which they confirm the mistake, explaining it was a question by one of the Brazilian editors to the journalist who wrote the original text in English, and that it was not supposed to be published..
^ a b c d e f g h i j k l m n o p "Reuters (news agency)". Encyclopædia Britannica. 26 March 2010. Retrieved 3 November 2012. ^ Stevens, Mark A. (2001). Merriam Webster's Collegiate Encyclopedia. Merriam-Webster. pp. 1, 366. ISBN 978-0877790174. ^ a b c d e f g h Allen, Katie (4 May 2017). "Reuters: a brief history". The Guardian. Retrieved 19 February 2017. ^ a b "Company History". Thomson Reuters. 13 December 2013. Retrieved 7 May 2014. ^ "News agency". Encyclopædia Britannica. 23 August 2002. Retrieved 18 February 2017. ^ "Baroness de Reuter, last link to news dynasty, dies". ABC News (Australia). Reuters. 26 January 2009. Retrieved 21 February 2009. ^ a b c Smith, Gerry (1 November 2016). "Thomson Reuters Cuts 2,000 Jobs Worldwide in Restructuring". Bloomberg. Retrieved 6 February 2018. ^ a b "Main Page - Handbook of Journalism". Handbook.reuters.com. 23 September 2014. Retrieved 17 June 2015. ^ Bumiller, Elisabeth (5 April 2010). "Video Shows U.S. Killing of Reuters Employees". The New York Times. Retrieved 24 August 2015. ^ "Collateral Murder - Wikileaks - Iraq". YouTube. 3 April 2010. Retrieved 17 June 2015. ^ Al-Mughrabi, Nidal (16 April 2008). "Reuters cameraman killed in Gaza". Reuters. ^ "Foreign Correspondents:The Tiny World of Anthony Grey". Time. 20 December 1968. Retrieved 22 May 2010. ^ "Ukrainian Hackers Leak Personal Data Of Thousands Of Journalists Who Worked In Donbas". Radio Free Europe / Radio Liberty. 11 May 2016. ^ Ives, Mike (9 July 2018). "Case Against Reuters Journalists in Myanmar Moves to Trial". New York Times. ^ "Wa Lone and Kyaw Soe Oo to appeal seven-year sentence". Al-Jazeera. 23 December 2018. ^ "Reuters journalists Wa Lone and Kyaw Soe Oo win Journalist of the Year at Foreign Press Association Media Awards". Press Release. Reuters Press Blog. 27 November 2018. ^ a b Tyson, Ann Scott, "Military's Killing of 2 Journalists in Iraq Detailed in New Book", The Washington Post, 15 September 2009, p. 7. ^ a b c Susan D. Moeller, "A Moral Imagination: The Media's Response to the War on Terrorism" in Reporting War: Journalism in Wartime (eds. Stuart Allan & Barbie Zelizer: Routledge, 2004), p. 68. ^ Encyclopedia of Journalism (ed. Christopher H. Sterling: SAGE, 2009), p. 1669. ^ Brian Mooney & Barry Simpson, Breaking News: How the Wheels Came off at Reuters (Wiley, 2004), pp. 184–85. ^ Austen, Ian (20 September 2004). "Reuters Asks a Chain to Remove Its Bylines". The New York Times. ^ Kroh, Kiley (16 July 2013). "Reuters Exposed: Publication Openly Hostile to Climate Coverage, Top Editor Doubts Climate Science". ThinkProgress. Retrieved 17 June 2015. ^ "Climate Change 'Climate of Fear': Reporter Blows Whistle on Reuters | Common Dreams | Breaking News & Views for the Progressive Community". Common Dreams. 17 July 2013. Retrieved 17 June 2015. ^ Chris O'Shea (16 April 2013). "Reuters Sends Paul Ingrassia to London | FishbowlNY". Mediabistro.com. Retrieved 17 June 2015. ^ Chris Roush (16 July 2013). "Ex-Reuters journalist: Wire service not interested in climate change stories". Talking Biz News. Retrieved 17 June 2015. ^ Romm, Joe (21 July 2013). "False Balance Lives At Reuters: Climatologist Slams 'Absurd' Use of 'Unrelated Climate Skeptics Nonsense'". ThinkProgress. Retrieved 17 June 2015. ^ "Reuters admits altering Beirut photo". Ynetnews. 6 August 2006. ^ "Reuters toughens rules after altered photo affair Photos". Reuters. Retrieved 15 August 2016. ^ a b Mozgovaya, Natasha (8 June 2010). "Reuters under fire for removing weapons, blood from images of Gaza flotilla". Haaretz. Retrieved 8 June 2010. ^ "Para blindar FHC, 'Reuters' propõe em matéria: 'podemos tirar se achar melhor'". Jornal do Brasil (in Portuguese). 25 March 2015. Retrieved 25 March 2015. ^ Winter, Brian (23 March 2015). "Entrevista-FHC diz que Lula tem mais responsabilidade política em caso Petrobras do que Dilma". Reuters Brasil (in Portuguese). Thomson Reuters. Retrieved 25 March 2015. ^ "Podemos tirar, se achar melhor". CartaCapital (in Portuguese). Editora Confiança. 24 March 2015. Retrieved 24 March 2015. Read, Donald (1992). The Power of News: The History of Reuters 1849–1989. Oxford, Oxford University Press. ISBN 0-19-821776-5. Fenby, Jonathan (12 February 1986). The International News Services. Schocken Books. p. 275. ISBN 0-8052-3995-2. Schwarzlose, Richard (1 January 1989). Nation's Newsbrokers Volume 1: The Formative Years: From Pretelegraph to 1865. Northwestern University Press. p. 370. ISBN 0-8101-0818-6. Schwarzlose, Richard (1 February 1990). Nation's Newsbrokers Volume 2: The Rush to Institution: From 1865 to 1920. Northwestern University Press. p. 366. ISBN 0-8101-0819-4. Schwarzlose, Richard (June 1979). The American Wire Services. Ayer Co Pub. p. 453. ISBN 0-405-11774-4. Wikimedia Commons has media related to Reuters Group. "Reuter Agency" . Encyclopedia Americana. 1920.